Today in my slog through the writing of John Carter and the Gods of Hollywood, I arrived at a moment that was personally a big one — the Hero Complex Screening of John Carter on February 27, 2012 in Burbank, with a Q and A with Andrew Stanton afterwards. I was at the screening, and this was the first time I saw John Carter. In researching it I came across this 10 minute video clip of Stanton describing his relationship to the material and how he came to be directing John Carter, and it struck me that out of all the interviews I’ve seen, this one provides one of the best opportunities to get what I would argue is a pretty strong sense of Stanton’s attitude toward Burroughs. Now, in posting this, if patterns hold true it will provoke a snarling response from certain contrarians, which in turn will provoke fans to defend Stanton, which in turn will provoke contrarian charges of “See, I told you, you all think Stanton is a God and can do no wrong”, which will then provoke countercharges. Can we just skip all that, since it’s something we’ve seen a hundred times? We get it. Readers here know that I’m on record that although he did a number of things I would have done differently, overall I fall into the camp of “pleased we got what we got” and grateful for this adaptation rather than what we would have gotten had some of the other screenplays that were in development ended up on the screen. I acknowledge that film-makers will be film-makers — they will personalize the adaptation in ways that may not suit me as a devotee of the novels. Are there any additional insights into Stanton’s creative process or his relationship to the material that this clip helps clarify? Bashers, you can certainly go ahead and bash but try to actually watch the interview before you do — invest 10 minutes, watch his body language, watch where he gets enthusiastic and where he reveals things that may add a new dimension to your understanding of what happens — and share your insights. If you can do so without going into “rant” or “vent” mode, it will be appreciated. My first introduction to Barsoom was from my dad’s book collection, which included a number of half worn-out ERB paperbacks from printings in the 60’s, 70’s and 80’s. I was eleven or twelve years old when I started reading them. My first Barsoom novel was Warlord of Mars, and I remember sensing that cool, eery feeling of being on another planet from the first passages. I fell in love with the world and creatures and characters and adventures, and put a selection of ERB books on every birthday gift list and Christmas gift list for the next several years. My mom no doubt ended up spending hours in old bookstores over those years, to help me finish my collection. Before too long, I had collected Princess and Gods, and eventually rounded out the whole series. Nothing compares. Thank you for sharing that, Dotar, and yes — there’s a huge difference here that might be at the heart of all this. You definitely found John Carter through a wondrous passage. My first exposure was the D’Achille paperback cover to Princess from my fathers’ bookshelf, and the opening lines of the manuscript. In both of our first encounters, it was the voice of the character, as written by Burroughs, who spoke first. 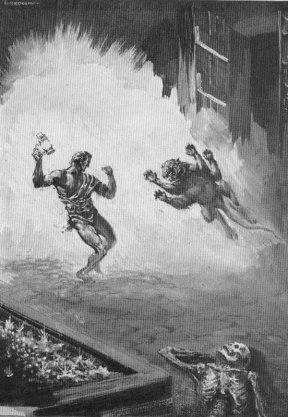 Stanton came to the world of Barsoom through another angle – the marvelous, though certainly lesser storytelling of the comic book series, and I have to wonder how much that affected his perception of the property, or the adaptation choices he would later make. [I dig his crediting the Marvel publishers for leading him back to the books, and his assumed mission to lead others back there with the film, btw]. When JCoM grabs you, it holds on, but clearly in different ways for different people, and I wonder how much ones’ introduction to it affects the tenor of that fan relationship. I would love to hear more ‘first encounters’ from the chorus at large here, it tends to be illuminating. As far as the music analogy goes, didn’t those bands end up making their own music, not doing covers of old songs? (well, I could be mistaken in that frankly, since I don’t know that much about music!) I don’t remember any negative comments regarding Cameron taking part of his inspiration from the Barsoom books with Avatar. For the comics, the only influence I can think of is the use of Tars Tarkas as a somewhat comic relief. He was also sometimes used that way in the Marvel run. The Finding Nemo 2 announcement seems like a blow to potential sequels. Andrew Stanton will now be booked for the next four years (they announce a 2016 release). In the meantime, we’ll see what happens with the rights, and there’s these options for two sequels in the crew’s contracts. Will they come to an end too? Probably. But you could be right too, Henreid, perhaps it’s a setup for Andrew Stanton to return to Barsoom later on. Whatever the reason, I sincerely hope Finding Nemo 2 will be a work of passion for him too. I’m the first to say that John Carter is not a perfect movie, that it could have been better, but I’m really a staunch supporter of Andrew Stanton for finishing the tale he began. I think it’s important for the visibilty of all ERB’s properties. I think M. Stanton himself stated that beautifully in the interview. Now the books will never fall into oblivion again, hopefully. It’s important that we have those sequels, to show that an ERB property not named Tarzan can be endearing and successful. That’s the way I see it, anyway. That’s an interesting analogy to explore. The Beatles used early American Rockabilly and RnB as their template, but as every talented musician realizes, no one’s particularly interested in listening to a slavish imitation of what’s been done before. So they put their own personal stamp on it to make it their own. The same can be said of Green Day and U2 with regards to Punk Music, and the same can be said of bands like Led Zeppelin or Black Sabbath when it comes to American Blues Music. The amps got louder, the guitars more distorted, the technical skill required more demanding, and the arrangements more sophisticated. But the blues is still in there, clearly, and no one has ever accused these bands of hating the roots music that inspired them or being arrogant for making what some would call “improvements” on it. Thanks for sharing this Dotar! I don’t doubt the man’s sincerity or his genuinely love for the property, because I for one felt I saw it in the finished project, especailly after multiple viewings, but also because my own introduction to the Barsoom series is almost exactly the same as Stanton’s. We both started with the Marvel comic around 1977, the same year as Star Wars came out, and quickly moved to the original Burroughs novels. And like Stanton, I thought after the success of Star Wars and a ton of other SciFi and fantasy films that a John Carter of Mars feature film was just around the corner, but 35 years later it still had not happened. The reason the film resonated so much for me was it was very much in the style of the kinds of popcorn films being released in the late 70s. I very much felt like this is the John Carter film we WOULD have seen if Lucas or Speilberg had directed it and had the technology been available at the time. At the end of the audio commentary on the BluRay Stantons says that what he tried to recreate on film was the feeling one got when reading the original novels (and I’m fully aware that this will most likely illicit a predictable response from the usual cast of characters), but for me he succeeded. I would also add, Dotar, that my very first introduction to John Carter: Warlord of Mars was the first annual issue, an adaptation of The Ancient Dead. I don’t even think it was that. It seems what he really loved was those Marvel comic books more than the actual novels and watching this movie you can sort of see it since those comics-while closer to ERB than Stanton was-still wasn’t that close. Heck one storyline had Dejah giving herself willingly to a Hawkman clone and Carter becoming a horn dog for a race of Amazons. Unfortunately that love didn’t extend to the characters, themes, plot, or Burroughs’ writing. I think the “coolest best friend, coolest girl, coolest pet” thing is telling in that he ‘gets’ the wish-fulfillment part —- but then adapted that into his own personal wish-fulfillment instead of what was written. He didn’t treat it like a great novel, or even as an especially good book to be taken seriously. He treated it as a beloved, charming little thing, full of fun monsters and details he loved from childhood, but that wasn’t good enough to work on it’s own without storytelling improvement from the greatness of his own pen. More in love with his nostalgia for the book than being in love with the actual book as written – if that makes any sense.I suppose, by virtue of being the guy who got the chance, that was something he earned the right to do. He was true to his personal vision of what the book meant to him, which is honest at the very least. And he got his reward! He got to make the John Carter film he wanted to make, and no one can take that away from him. Nicely put. I’ve always been struck by the way he discovered it –guys drawing these cool green creatures …wow, what’s that…..tharks! here’s a comic, check it out….. Sometimes I am away for weeks on these glorious adventures in solitude. That was how I got drawn in …so different. I realize I have said a lot of that previously, so here is something positive I don’t think we’ve discussed here before. He mentions he discovered John Carter at about the same time he found Led Zeppelin and Pink Floyd. This speaks to, I think, the core of his love for Barsoom. That particular artistic intersection I find very interesting, especially since we know he was adamant about using Kashmir in the trailers. While there was criticism here and elsewhere about using that track, about how it seemed old fashioned for an epic trailer… I believe he did that because he felt very strongly about the soulful association between that music and this story, something very likely forged early on. His insistence to use this song may not have helped sell tickets, but I always thought it worked for the movie (at least in spirit), and I love/respect that he fought that battle. I suspect he’s going to knock out another mega-hit for Pixar to re-prove his box-office cred, and once he does he’ll be aiming back at live action. That doesn’t necessarily mean the end of the world for ‘Back to Barsoom’. I remember this interview back when it first popped up online, before I saw the film, and it was hard not to be pulling for him to succeed back then. It’s definitely the most in-depth description of his relationship to the material – (and best re-telling of those stories, imho). I don’t doubt his passion for Barsoom, never did – he obviously loves the world and the situation Burroughs created, the creatures, the ships, the transporting imagination of it all. Barsoom could have done much worse with another director, someone who cared less, or came later to the party. He clearly grew up wanting to see this world on the screen. There’s so much that is admirable about his effort to put it there. Unfortunately that love didn’t extend to the characters, themes, plot, or Burroughs’ writing. I think the “coolest best friend, coolest girl, coolest pet” thing is telling in that he ‘gets’ the wish-fulfillment part —- but then adapted that into his own personal wish-fulfillment instead of what was written. He didn’t treat it like a great novel, or even as an especially good book to be taken seriously. He treated it as a beloved, charming little thing, full of fun monsters and details he loved from childhood, but that wasn’t good enough to work on it’s own without storytelling improvement from the greatness of his own pen. More in love with his nostalgia for the book than being in love with the actual book as written – if that makes any sense. I suppose, by virtue of being the guy who got the chance, that was something he earned the right to do. He was true to his personal vision of what the book meant to him, which is honest at the very least. And he got his reward! He got to make the John Carter film he wanted to make, and no one can take that away from him. It’s also why we need never feel bad dissecting it on the autopsy table or criticizing every decision to our hearts’ content —– that comes with the deal of getting to direct your dream project at an astronomical cost. Everyone else gets to have their say about it. This just in: Stanton sequel prayers answered? He’s now set to make Finding Nemo 2. OK this didn’t change my view. But…no it didn’t reveal anything new either.I didn’t come away from this with anything new-there was no explanation for why he did certain things, no reason why he felt he was the one to make this movie, nothing except the usual prerehearsed stories he’s been telling now forever. Except for his comparison to the Beatles and I’ve never heard U2 or Green Day or any other band say they needed improving. This was a good interview with Stanton. He really seems to get it about the original stories of ERB which makes me wonder why he made the changes he did. I never read the JCM comic books, so maybe that influenced him somehow. I DO believe if he got the chance to make the trilogy, the three films together would have culminated in a more satisfying whole. Especially after John Carter, by the end of the movie, became the John Carter I loved. Now he could finish the stories as they were written.